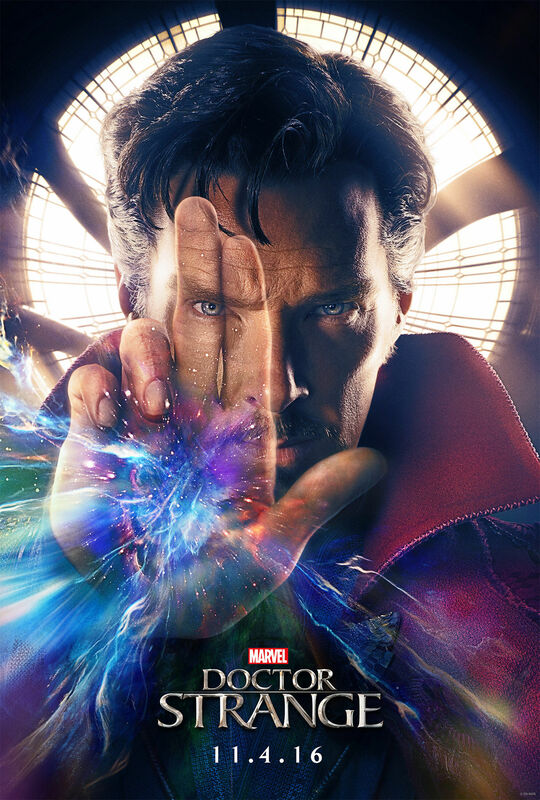 A former neurosurgeon (Benedict Cumberbatch) embarks on a journey of healing only to be drawn into the world of the mystic arts. Fresh, different, throw in a few crazy visual effects and we’re onto a winner. Ol’ Cucumberbatch nails it as the cynical and quick-witted super doc. Imagine if House had super powers and you pretty much have Steven Strange. The opening sequence left me in awe. The visual and special effects were incredible. Imagine all the dream welding sequences in Inception and crank that up to 11! It really was a feast for the eyes and that was before Strange got to mess with the dimensions! The fight sequences were brilliantly choreographed as the masters manipulated time, space and every object possible to gain the upper hand. Twisting and bending skyscrapers to their will. The film didn’t really mess about. It zipped along. Jumping from one thing to the next. Establishing the egotistical Strange early on and channeling a little bit of Sherlock. Only taking the cases that interest him. Showing off his talented surgical abilities at any opportunity. That was (Of course!) before tragedy struck. I could feel the pace lagging a little when Strange went through his self-loathing phase before discovering Kamar-Taj; a spiritual Tibetan safe haven that would set our hero on his true calling. Tilda Swinton (We Need To Talk About Kevin) was on scene stealing form as The Ancient One (No seriously, that’s her name). She rocked the Avatar/Morpheus look. Frankly, she wasn’t in it enough. I was a little disappointed after having such a heavy involvement in Strange’s training that she just disappeared into the background. Shame. Mads Mikkelsen was brilliant as the sinister Kaecilius (Even if his name was a little silly-ous). I don’t think you could have had anybody better than Hannibal Lecter to play the maniacal nutter hell bent on summoning a powerful demon to harvest the energy of the planet. Armed in tow with a cult of warped followers (wearing some crazy eye make up); Strange was up for a challenge. After watching so many Marvel movies, I was worried that I’d get bored of watching another origin story and enduring another training montage BUT Doctor Strange brought something new to the table. All the portal conjuring and space shifting stuff subdued my griping. There was one sequence in which Strange was having an out of body punch up with another adversary while a doctor was trying to resuscitate him. It was mental. Exhilarating, funny, riveting. I loved it. All aided by another fantastic movie score from Michael Giacchino. There was the right balance of humour and trippy dimension bending. And that Cloak of Levitation . . . Seriously, it was like Aladdin’s magic carpet. Choosing the stubborn doc as its new host. Coming to his aid at the best time. Benedict Wong (The Martian) was hilarious as Wong (No typo), the sworn guardian of the Ancient One’s library. I loved the awkward banter as Strange attempted numerous times to make the stern faced monk crack a grin. Rachel McAdams (Spotlight) was tragically reduced to playing the love interest left waiting on Strange’s beck and call. A waste of a very talented actress. Tragically, the incredibly repetitive finale with all the timey wimey guff left things on a bit of bum note. Once you’ve seen Strange pulled about into various shapes and sizes through all the multi-coloured shapes and dimensions, I did get a little fidgety. Cumberbatch and Chiwetel Ejiofor were a great pairing BUT they didn’t quite get the screen time that I wanted and the 12 Years A Slave actor got a little lost in all the chaos. However, it was still entertaining, funny and enthralling. Doctor Strange showed enough promise for things to come and is most definitely a welcome addition to the ever growing Marvel movie-verse. Now, I don’t want to sound like a school teacher drolling on. BUT it’s a Marvel movie; so what do we do when the credits roll? That’s right. You park your butts on the seat and wait for the teasers. I won’t spoil any BUT there are TWO! So don’t get up after the first one. A bit more than OK, ja? Meet Mija (Seo-Hyun Ahn), a young girl who risks everything to prevent a powerful, multi-national company from kidnapping her best friend – a massive animal named Okja. Strange, charming, quirky. What did you expect from the guy who gave us The Host? I was surprised to see a Bong Joon-ho flick on Netflix. I’m glad the Twitter poll recommended this. The eclectic opener with Tilda Swinton’s (We Need to Talk About Kevin) brace ridden quirky corporate exec didn’t really give me high hopes. Swinton doesn’t like to do normal, does she? BUT we wouldn’t have it any other way. The random statistics and animated PowerPoint presentations threw me into a mini-coma. To cut a long story short, the world is overpopulated and running out of food. Cue the discovery of “super piglet” on a Chilean farm, a litter of little super piglets and a worldwide competition among farmers to grow the biggest pig. Fast forward 10 years to a beautifully pastoral Korean forest setting. Darius Khondji’s cinematography was breathtaking. The animation was very good. The detail on Okja was brilliant. A cross between a giant hippo and a elephant with the mannerisms of a dog. Mija and Okja reminded me of characters from a live action Studio Ghibli animation. I loved the dynamic. There was an easygoing feel to the piece as we watched the pair hunt and frolic in the woods. Establishing that their bond was more than just a farmer raising her produce. It wasn’t long before the pair’s safe haven was disrupted by the emergence of the squeaky and highly flamboyant simpleton Johnny Wilcox (Jake Gyllenhaal – Donnie Darko). A fame-seeking animal loving TV host. God knows what Gyllenhaal was smoking while taking on this role?! He was bloody mental and hilarious. A deluded hypocrite. Scene stealer in every frame. Of course being “company property”, Okja must return to New York to claim her prize as “best pig” and face her impending fate. Throwing Mija into one mad journey. Seo-Hyun Ahn was brilliant as the resilient Mija. It takes a lot for a child actor not to infuriate me BUT she played the role perfectly. The Seoul street chase was a fantastically choreographed and entertaining sequence as Mija ran through alleyways and dived over highway bridges. Things taking a highly comical turn when a group of animal activists decide to free Okja at the same time. The Animal Liberation Front were a great addition to the mix and featured a surprisingly talented supporting cast. I couldn’t help but laugh as the gang tried to remain peaceful during Okja’s rescue mission. The friendliest highway robbery I’ve ever seen (“Please co-operate”). Pointing a gun at the truck driver, demanding he put on his seat belt before ramming him off the road. Swiftly followed by a sincere apology. Desperate not to use violence by any means. Steven Yuen (Glenn from Walking Dead!) and Paul Dano (Swiss Army Man) were excellent as K and Jay. Dano’s reaction at the speed of the Korean language to English as he asked to be translated was a particular highlight. Lily Collins (Love, Rosie) did her best to hide those brows from the balaclava BUT I knew it was her before the big reveal. Devon Bostick has come a long way from his Wimpy Kid days. His character Silver had so much potential BUT didn’t get enough screen time. Refusing to eat in order to leave the smallest carbon footprint. I felt their characters got lost in the chaos. Shame. And that was kind of the problem; the pace lumbered things drastically (especially during the middle act) that I could feel myself fidgeting. Breaking Bad’s Giancarlo Esposito was wasted in his minute role as Mirando’s underling. I was happy to see Trainspotting’s Shirley Henderson feature. Moaning Myrtle just doesn’t get a break. The second half certainly delivered a more rewarding affair BUT I didn’t expect the direction it took. I would have said that this was a kid’s film right up until Okja’s incarceration in a New York lab. Bong Joon-ho brilliantly encapsulated the GM food crisis perfectly. Showing the brutal treatment of animals. I’m not a vegetarian BUT even I was left feeling queasy. Especially during the “natural non-forced breeding” process. The gruelling underbelly of corporate control as Swinton’s Mirando tried to turn Mija and Okja’s bond into one big PR stunt to help change her company’s bad image. I thought Snowpiercer was dreadful. The saving grace (Sorry, Chris Evans) being Tilda Swinton. I was getting disappointed at her lack of screen time. That was until the mad final act. She delivered everything I expected. The closing minutes left food for thought making this a rewarding and charming little film (If a little long at the tooth) that delivered raw social commentary and mad humour.